Scorpio September 2015 Horoscope foretells that this month is important for financial and career matters rather than love or family. However balancing home and career will be necessary for professional growth and will be a source of stress. Planetary power is in the eastern half of your birth chart suggesting that you can be independent to take decisions over your growth. Use the Mercury retrograde 2015 to your advantage while seeking the cooperation of others where required. Career growth will be satisfactory for the Scorpios in September 2015. You have the support of your superiors in your professional successes. Social connections and hard work will help you in the progress of your business. Also get a look at your 2015 Chinese horoscope predictions to look at the coming year from a different perspective. The September 2015 Scorpio monthly astrology predictions forecast that the monetary situation will be excellent with some volatility thrown in. Major transformations in financial planning are likely to suit your interests. Your financial goals will be decided based on the welfare of your family and not on your personal likes and dislikes. Single Scorpions will meet their romantic partners online or in social and religious gatherings. For married people, love becomes happier in the second half of the month. That’s the time to get pregnant. First half will be delicate and you will have problems with your spouse. You tend to be irritating and critical which will upset your equation with your partner. Relations with children too might be disturbed. 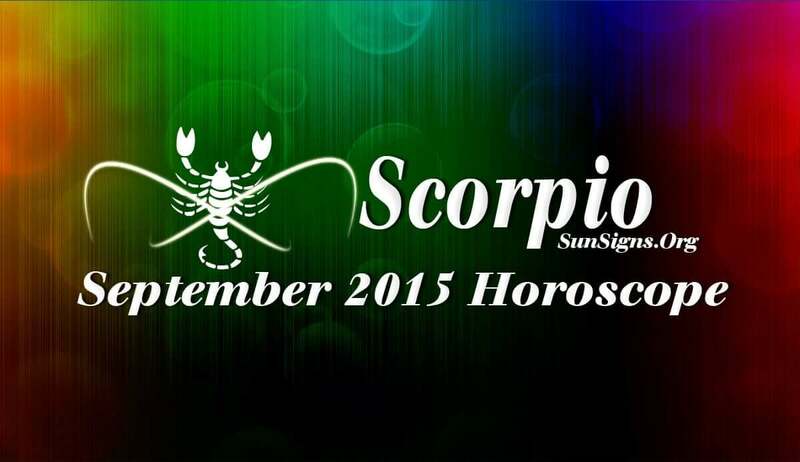 The Scorpio September 2015 horoscope suggests that no problems are expected in your health this month. This is the right time to review your fitness and diet regimes. Be it eating healthy or reducing stress, take the right steps right now before it is too late.